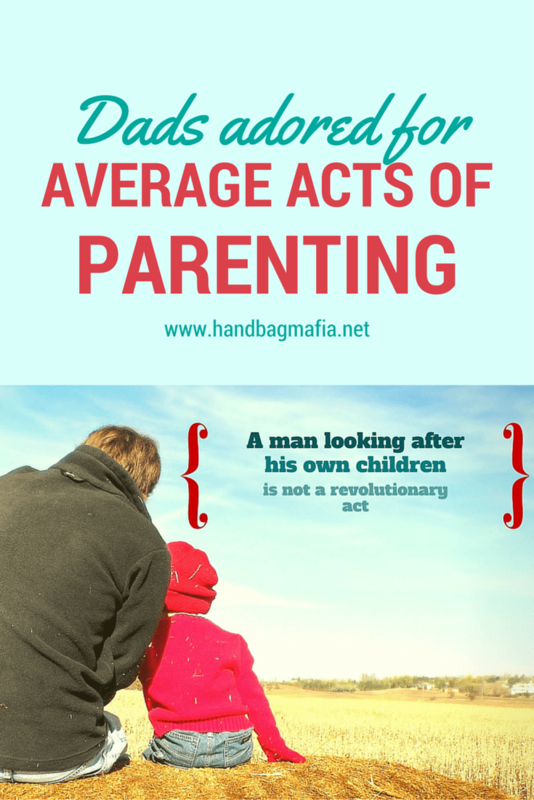 It’s difficult not to notice that men, in this day and age, are highly regarded when they parent. Whether it’s cleaning up after the kids or making dinner, it seems we can’t get enough of men who parent. For example, DadMum is the facebook page of a man called Brad Kearns, who has been looking after his children while his wife is ill in hospital. His page went viral extremely quickly, amassing tens of thousands of fans within his first couple of posts that documented his rueful attempts to manage the home in his wife’s absence. It’s pretty clear to me that Brad is documenting his efforts as a way of acknowledging and appreciating all that his wife normally does. I don’t have a problem with that. How they work out who does what in their home is their business. What strikes me the most is the response to it. The massive amounts of praise and wonder directed at a man who is simply parenting his own kids. Why do we make heroes specifically out of men for doing what many women and men do every single day? Chris Hemsworth Baked A Cake. Think about the recent facebook sensation that was Chris Hemsworth baking a cake for his kid’s birthday. Shared thousands of times, women in particular gushed over what a great dad he is for performing this most ordinary of tasks. I don’t think I’ve ever seen a female star as celebrated for something so mundane. Again, no disrespect to Chris. He’d be welcome to bake a packet of cake mix for me anytime. But is it really that impressive? The problem is not with men doing these things; to me, it’s the golden halo we adorn them with for doing so. DadMum is an excellent example; in this article he is billed as an “exhausted dad revealing the difficulty of being mum“. Brad Kearns himself refers to a hard 16 hours of “being mum”. Although I know what he means, it’s problematic because he isn’t “being mum”. He is their father, right? These are his children. If his partner is ill and hospitalised, it should fall to him as a parent to care for his children, not because he is “being mum” for the time his wife isn’t present but because he should be being dad, regardless. Why are we so impressed by a man doing exactly what any reasonable person would expect him to do under the circumstances? He can hashtag #iwanttobeadadagain as much as he likes but the reality is that looking after your children for whole days at a time is part of being a parent, whether you are a mother or a father. The way we respond to men as parents is part of a vicious cycle that affects men and women both. We are enthusiastic and generous with our appreciation for men who are doing literally nothing that women haven’t been doing for centuries. We perpetuate a belief that men who do these things are the exception and not the rule. We adhere, despite our best intentions, to the idea that men who actively parent are rare because really, parenting is a woman’s role and responsibility. A man can hold the fort for a while, sure, but he will need a woman to rescue him eventually. Via Man who has it all. This cycle has no winners. We make men who are active, involved parents seem like anomalies. It could be argued that we hold these men up as shining examples to the rest, to inspire them to be better fathers, and I hope some take it this way. However, it also sends a less positive message; one that says to men that they simply aren’t expected to be capable and involved parents. And when they are capable, it’s surprising. We feel the need to commend them at every turn. The cynic in me knows there are men who take full advantage of this tired stereotype, to the detriment of their partners and relationships. 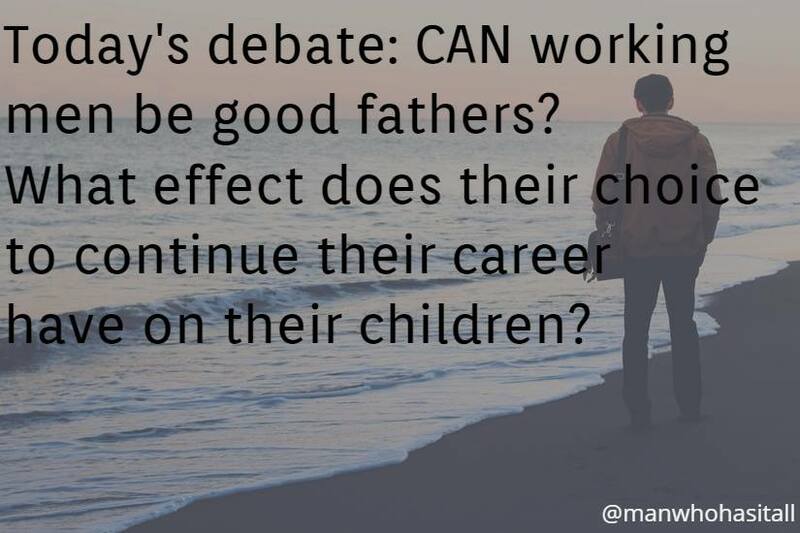 However, plenty of men want to be more involved and active but feel inadequate and incapable.This leaves mothers back at square one; we are expected to do the lion’s share of parenting because we are also fed the same lines. We can’t expect the fathers of our children to care for them as well as we do, because they are men. We can’t trust their parenting instincts, because they don’t really have any. We must do most, if not all, of the parenting on our own. This issue goes beyond DadMum or Chris Hemsworth or any other bloke receiving excessive praise for ordinary acts. At a recent press conference, Bill Shorten outlined Labor’s plans for childcare affordability. In doing so, he stressed the importance of supporting working women and making childcare more affordable to avoid a woman spending up to 80% of her income on childcare costs. See what he did there? Childcare costs fall on women alone, do they? He’s not the first to make the correlation. A recent study released by the Australian National University suggested that women could end up working for as little as $5 an hour once childcare costs were deducted from their net wages. I have no doubt that single parents struggle with childcare costs- I know I did when I was a single parent. However, in families with two parents, why would child care costs be the sole responsibility of the mother? Even if a woman is working outside the home, it’s still primarily her responsibility to see that the children are cared for. Men Who Parent Are Not Exceptional. Gone are the days of the majority of women staying home, keeping house and raising children that are seen and not heard when their fathers return from a long day’s work. We want men who are co-parents and just as important and active in our children’s lives as their mothers are. We can’t continue to accept the tired trope of the bumbling father who can’t manage even the humblest of domestic or parenting duties. I feel like, in our determination to make men parenting equals, we’ve gone too far in the other direction. A man baking a cake or looking after his children on his own is not a revolutionary act. Maybe it once was, but not anymore. Fathers everywhere do these things. It’s not that we shouldn’t appreciate good men doing their part. It’s when we put them on pedestals for it that it becomes a problem. We are amazed that a man can bake a cake. We congratulate a man who cares for his own children. We are in awe of a man who has a rough day with babies to look after. Our hearts are bursting for a Dad who was so busy with his kids that he didn’t have time to shower or shave for a whole 16 hours. Gimme a break. I feel for any parent having a rough time. It’s just that these things are the everyday reality of life as a parent for mums and dads everywhere. It’s wonderful to see more men being involved, hands-on parents. I’m thrilled for them; they’ve moved away from toxic patriarchal ideals that kept men uninvolved with the raising of their kids in the past. They don’t have to miss out. Their kids don’t have to miss out. I love that what is normal for fathers has shifted so appreciably. However, I refuse to wax lyrical because a man changes a nappy or looks after his own gastro-stricken child. I’m not going to heap praise on men I don’t know for baking something or wearing their kid in a baby carrier. I’m not interested in lavishing compliments on men for simply participating in the lives of their own children, because to me, that’s what they signed up for. It’s 2016; surely fathers don’t need constant congratulating for doing the things that mothers have always done.